Apple today showed off iOS 10, what it calls the biggest release of iOS ever for both end users and developers. To start, the platform changes up the lock screen, making it easier to access the camera, notifications, Control Center, and widgets. A shake-to-wake feature lets people turn on their phone by shaking it as they raise it up. 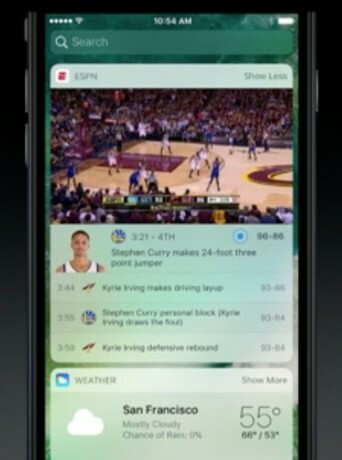 Widgets have gained the power to show dynamic content, including live video. Many of the improvements center on the 3D Touch functionality, which will only be available to newer iPhones. Siri in iOS 10 will be much more advanced because Apple is opening Siri up to developers. Siri can now handle more conversational language requests and interact with apps such as Skype, WeChat, ShutterFly, and others. iOS 10 brings Siri's smarts to the QuickType Keyboard, too. For example, Siri can automatically schedule a lunch date based on comments in iMessage regarding restaurants, dates, and times. The QuickType Keyboard supports current location, contact information, calendar availability, and more. iOS 10 makes changes to Photos, including better organization based on location data. Moreover, Photos adds advanced visual calculations so the app can automatically find and organize photos based on faces, objects, and scene recognition. Apple also uses new AI to cluster photos related based on people, scene, and location to automatically create albums. Apple says a new user interface makes the collections easy and engaging to use. Photos gains new editing tools, too, allowing people to add filters and to photo and video galleries. Apple Maps sees a design refresh, with simpler search tools. Navigation has been simplified so it is quicker to understand and access route details, such as gas stations or restaurants. Apple is opening up Maps to third-party developers, so others can add extensions to Maps to book reservations or hail Uber rides. iOS 10 features a new version of Apple Music. Apple News has been refreshed to include a new design, subscriptions, and breaking news alerts. iOS 10 adds an app called Apple Home, which integrates with HomeKit-comaptible gear around the house to control connected gear. The revised platform from Apple also now plays better with VoIP apps, permitting incoming calls from any app to reach the lock screen. Last, the iMessage app gains rich links, so users will see previews of links directly in iMessage. The app works better with the camera, as well. Emoji will appear three times bigger in conversations, and the keyboard can predict which emoji best fits the convo. People can easily control the size of text bubbles to convey volume. Apple is previewing iOS 10 to developers starting this week. A public beta will be available soon, with the final release expected in the fall. Google today offered developers a new build of Wear OS for select Android smartwatches. The update chiefly installs the Actions on Google feature that Google announced earlier this month, but it also introduces more power-related enhancements and a dedicated battery saver mode.